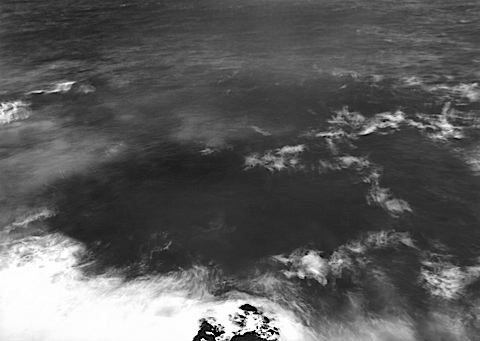 There's a place that as kid you called the farthestmost point — the most distant you could get, the place that when you stood there you could pretend you were the only person in the world. Being there made you wary, but it also put a kind of peace into you, a sense of security. Beyond that point, in either direction, you were always returning, and are returning still. But for that moment, even now with Whitby by your side, you're so remote that there's nothing for miles — and you feel that. You feel it strongly. You've gone from being a little on edge to being a little tired, and you've come out on this perfectly still scene where the scrublands turn to wetlands, with a freshwater canal serving as a buffer to the salt marsh and, ultimately, the sea. Where once you saw otters, heard the call of curlews. You take a deep breath and relax into the landscape, walk along the shore of this lower heaven rejuvenated by its perfect stillness. Our legs are for a time no longer tired and you are afraid of nothing, not even Area X, and you have no room for memory or thought or anything except this moment, and this one, and the next. — from Acceptance, by Jeff Vandermeer. This is from Book 3 of the Southern Reach trilogy, about Area X. Each book is very different in tone, with a distinct kind of horror. I'm almost at the end now. I have great admiration for this series. Imagine, she had told Control next, that language is only part of a method of communication. Imagine that it isn't even the important part but more like the pipeline, the highway. A conduit only. Infrastructure was the word Control would use with the Voice later. The real core of the message, the meaning, would be conveyed by the combinations of living matter that composed the words, as if the "ink" itself was the message. "And if a message is half-physical, if a kind of coding is half-physical, then words on a wall don't mean that much at all, really, in my opinion. I could analyze those words for years — which is, incidentally, what I understand the director may have done — and it wouldn't help me to understand anything. The type of conduit helps decide how fast the message arrives, and perhaps some context, but that's all. Further" — and here Control recognized that Hsyu had slipped into the rote routine of a lecture given many times before, possibly accompanied by a PowerPoint presentation — "if someone or something is trying to jam information insider your head using words you understand but a meaning you don't, it's not even that it's not on a bandwidth you can receive, it's much worse. Like, if the message were a knife and it created its meaning by cutting into meat and your head is the receiver and the tip of that knife is being shoved into your ear over and over again..."
— from Authority, by Jeff Vandermeer. This is from the second instalment of the Southern Reach trilogy, about Area X. Annihilation was creepy, thrumming our unease with the unknown in our external world. In Authority, the creep factor stems from the unknown in our intimate world — an invasion into the places we live, the work we do, the people we know. 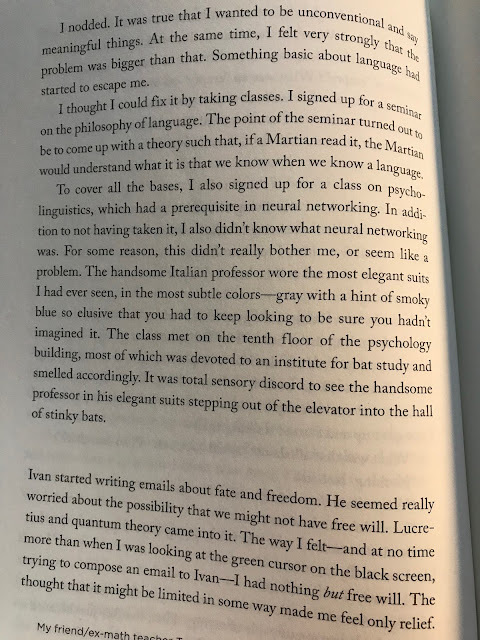 Recalling what a joy The Idiot, by Elif Batuman, was to read. Weeks on, I'm fuzzy on some of the details, but still talking about it. Nothing special has happened today; no one can say she was more provoked than usual. It is only that every day one grows a little, every day something is different, so that in the heaping up of days suddenly a thing that was impossible has become possible. This is how a girl become a grown woman. Step by step until it is done. Award-winning, genre-bending feminist dystopia. Praised by Margaret Atwood. 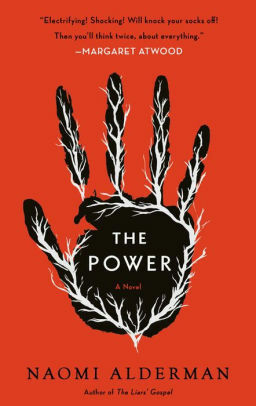 The Power, by Naomi Alderman. A huge disappointment. A fascinating premise, and a book for our times, the execution was weak and formulaic, with characters I didn't care about. What The Power does do quite cleverly is flip gender expectations upside-down. Boys dressing as girls to seem more powerful. Girls dressing as boys to shake off the meaning of the power, or to leap on the unsuspecting, wolf in sheep's clothing. I'm surprised this book wasn't written before now; it's as if it were waiting for its time. Girls have evolved to have an organ of electricity; they can channel this "power" through their fingertips like lightning. It can kill. This sets the world on fire, with women wresting control from abusers, criminal, harassers, despots. Women take back the night, and then some. As provocative as the ideas are in this novel, it feels like it was trying to do too many things. The cross-cutting of several perspectives, the overall pacing, the graphic nature of some scenes, the "real-life" politics (mentions of military training, UN sanctions, a play for oil) — these elements give the novel the feel of a thriller, of a genre novel. I'm not proud of myself for using that word ("genre") disparagingly here (I trust most readers recognize that I read broadly and I have nothing against genre-bending), but the novel packs all this in and more to the detriment of more meaningful plot and better realized characters. I suspect the work of a marketing-savvy editor with an eye on film rights. That being said, The Power is a worthwhile thought experiment. Beyond the role switching, the novel questions power dynamics, the nature of power itself, and the corruption of individuals who hold it and wield it. Do you think that you are so exceptional that if you had been born a German in the 1930s, you would have understood immediately that Lebensraum was a lie? That you would have tried to assassinate Hitler? Do you believe that your ethics are so exceptional that you would immediately have rebelled? If you and I lived in a world where women were dominant, would you be telling yourself: This is very unjust; I will fight for the rights of men? If we lived in the world of the power, I don't think I would be magically excluded from the way the world operates. I don't think I can say I would have been the enlightened person. With or without the power, I behave the way the system teaches me to behave. Early chapters reminded me strongly of SNL's Welcome to Hell skit, from late 2017 (viewable in Canada here). The things you don't want to know, Roxy, those are the things that'll get you in the end. "I am not a writer, I am an atmosphere," Lúcio Cardoso quipped. Brazilian, gay, and by all accounts larger than life. And this book is some kind of atmosphere. 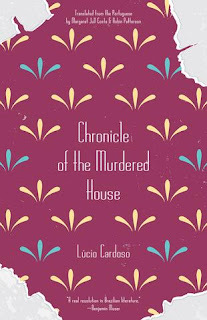 Chronicle of the Murdered House, by Lúcio Cardoso, did not at first appear to be the kind of book I would enjoy. But what is bookclub for if not to push me to appreciate books I might not otherwise pick up? The first strike against it: it's long, almost 600 pages, which I think is a little much for bookclub to demand of me. Second, a quick scan showed it to be epistolary in nature: a collection of letters, diary entries, confessions, et cetera. Not really my thing. I find it hard to keep track sometimes of who's writing and when; I expect the author/narrator to ensure the entries are suitably "curated" — such a novel demands a strong framework (I hold it to higher standard than a "traditional" novel, and so it more likely to fare poorly). Third, there's something florid about it. The framework contributes to the sense that this book is much older than its 60-odd years. The language is dense and musty. It feels altogether of another era. But bookclub. What else did I have to do in the deep cold of winter? And wow. A mere five pages in, there's a spectacular reveal. André in his diary is questioning the meaning of it all — love, life, death — and mourning his lover, Nina, a paragon of beauty and life struck down too young (although in these early pages it's not clear whether by illness or something more nefarious). It's overly sentimental. André is highly dramatic (it's not till much later that we learn he is only 16 years old). On the fifth page, he clearly identifies Nina as his mother. Oh, the melodrama, the scandal, the sin. Chronicle of the Murdered House is a love story, a tragedy, a family drama, a morality tale, a mystery, and a horror story. This is the story of Nina and her effect on the Meneses family (I started pronouncing them the "menaces"). 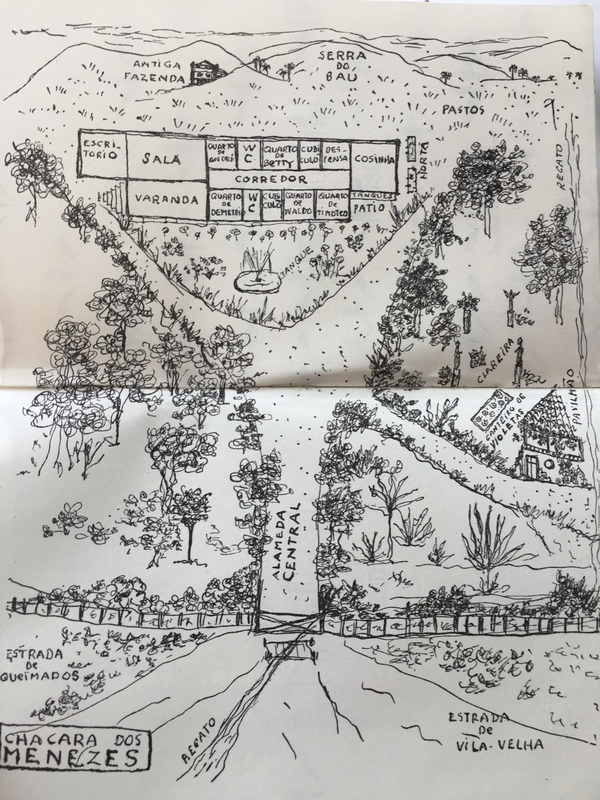 When Valdo, the youngest of three brothers, brings home a young wife (well, she arrives separately), the reader anticipates a breath of fresh air, to stir up some dust in this proud family. But I was not prepared for this. The title is inspired and it serves the story well. Curiosity #1: The house of the title. The title highlights a gothic element — indeed, the Chácara, the historic family home, is a strong character. The house is dim and stuffy, preserving bygone traditions. It has an army of servants. It has its own generator, with flickering yellow lights. It overlooks what was once an impressive garden, with a pavilion. The house is gradually falling into disrepair. By novel's end it is crumbling, "an abandoned skeleton." The house of course represents the family name. With Nina's death, the windows are finally flung open. Curiosity #2: The murder of the title. I won't tell you who dies. Well, yes, the house — both that which physically stands and the family that presided over the land — dies. But the title supports the framework, establishing the novel as a mystery. The book is a compilation of accounts, of witness testimony, regarding certain events. (It is not revealed till the end who has gathered these documents together.) While the accounts are not obviously contradictory, they occur in different personal contexts, they focus on different aspects, they are imbued with different emotions. All of this raises the question of absolute truth. While there is no clear murder mystery as the book progresses, the structure sets up the reader to believe there is one. John 11:39-40. It links the smell of disease and decay to resurrection, or the absence thereof. Toward Nina's end, the stink is unbearable. I read with wrinkled nose. So there is no salvation in this house. "Christ is nothing but a lie" (p 573). Curiosity #4: The summoning of the monster. There's a scene I found utterly monstrous, horrific, Lovecraftian. Nina's lover recounts how "down my fists and my fingers ran a liquid which was neither blood nor pus, but a thick, hot substance that dripped down as far as my elbows and gave off a foul unbearable smell," (p 468) like her rotting lifeforce. It's really weird and unpleasant, but not entirely out of place. Nina is a catalyst for something, allowing the true horror (of the house?!) to manifest itself. When she first comes the Chácara, Nina is a breath of fresh air, but she's also trouble. (I picture Nina as Rita Hayworth's Gilda.) She's also very much a victim. As monstrous as her behaviour is, I can't help but feel sorry for her. She is a creature of her body, of sensuous pleasures — as she has no moral code, it's hard to condemn her for breaking one. They are positive/negative. Nina is colour and life, Ana is dour and gray. Nina is spontaneity and impulse and laughter, Ana is deeply unhappy and deeply repressed. Ana feels the burden of sin deep in her soul. Nina drinks champagne. Ana is married to the eldest Meneses brother, and she is one with the house. Her confessions (to an actual priest) constitute a significant portion of the testimony in this chronicle. She figures prominently enough that one may say the novel is the story of two women, a study in contrasts. Curiosity #6: The buried family secrets. Senhor Timóteo is the Meneses brother nobody speaks of. An obese, cross-dressing embarrassment, he is quite literally buried alive, condemned to his room to watch life pass him by from his window over the garden. Then there's the great aunt, whose portrait was removed from the drawing room. It was the face of a woman, there was not doubt about that, but so stern, so unemotional, so detached from any mean, everyday thoughts, that it was more like the face of a man — a man, moreover, utterly disillusioned with the vanities of this world. There was no promise of serenity, none of the greens and pinks that conceal barely suppressed laughter or the twinkle of a sudden burst of youthful spirit — no. Everything about that face was dense and mature. The colors were the grays of tamed passions and the ochers of contained violence. It wasn't the face of an old woman, but of a woman at the outer limits of herself, with nothing to cover herself but the truth itself, whose caustic effects might or might not be dangerous. 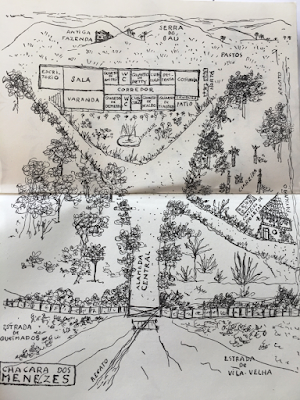 In 1959, Cardoso was giving gay culture a place in Brazilian literature. Curiosity #7: The snake, the wolf, the revolver. The snake completes the Biblical allegory of the garden. The wolf is an external unseen predator, possibly imagined, a false pretext for a revolver. I'm not sure what to make of the revolver. Some jazz: "Chronicle of the Murdered House," Part 1 and Part 2, by Larry Nozero.